LOL!! If it is not a big deal to learn French, she should be completely fluent by now! It's the biggest thing she has to learn, she is not a normal citizen of the principality but the princess consort. She has admitted herself that she doesn't fit in the environment and knowing the language is one of the things that would help her. Languages for Europeans are very important, and considering that Monaco has its own language I'm sure that they are very proud of it and want to conserve it. If their princess doesn't know it, it's not going to go well for them. English is important but every country in Europe has two or more official languages and to have a good job you need to know not only one or two but maybe three or even more. She's been there for +5 years and she hasn't learn much, I can understand that it's a difficult thing but it's extremely important. If she doesn't learn I don't see monaguesques warming to her. The new princess of Monaco Charlene changed, slightly, the original spelling of his name in English, the French, the official language of their new home, now wants to be called Charlene, with the first "e" pronounced open. At the wedding, held last Saturday (2), Charlene won the husband, Prince Albert II, a tiara of diamonds representing the waves of the sea, in allusion to the ancient craft, swimmer. Pope Benedict XVI sent the bride a third of pearls with gold medallion representing the arms of the Vatican. 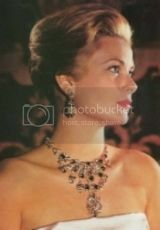 Charlene also abjured the Protestant faith to embrace Catholicism, the official religion of Monaco. I wondered about that, when I was on Wikipedia the other day I noticed an accent mark that wasn't there before. I saw photos of the gift Prince Albert gave her. And that was very nice of the Pope to send something to her for the wedding, too. I think she will learn. Just give her some time. Learning new languages is difficult and takes time. If she wants to learn a language quickly, she should study French for a little while and then ask everyone to only speak French around her. She will feel lonely at first, but after 3-6 months she will be fluent and very comfortable with the language. My aunt was a foreign exchange student when she was in high school. One of her best friends took French and was hoping to get placed in France. Well, he ended up in a Spanish-speaking country in South America! He was lonely for a while, a few sad letters, but after a few months he became more comfortable and after 6 months he was completely fluent and happy to be where he was. As for living in Monaco, maybe there are enough English speakers there where she didn't really need to learn in. But as the princess of a country that's official language is French, and Monégasque is also widely spoken, she really should start learning as soon as she's settled in. KF - Agree. Princess Charlene was NOT controlling, sick, and manipulative (like Kugly). She is ladylike and sweet. Alexandrine - Princess Charlene wants to modernize Monaco, true, and I thought THAT (Starbucks and Blahnick Boutique) sounded odd, too, however I really have to believe she was just giving examples of modernization ? Monaco IS dazzling and flashy so maybe she was just thinking along the lines of MORE current shopping choices ? Clow - Seems like you do not like Princess Charlene ? Can I ask why exactly ? I think she is perfect for the reigning Princess of Monaco..regal, stately, gorgeous beyond belief, ladylike, statuesque, compassionate, hard-working, accomplished, exquisitely dressed and coiffed, gracious, smart and has a FULL diary on her honeymoon (see below) . And, Yooper is right. French is tricky, changes, and is extremely difficult to learn, fluently. Don't worry, Princess Charlene will learn it, she has been working hard to learn French. Cheesh, not bad; she's even working on her honeymoon, not taking a second honeymoon while working. Just like Diana actually, who had entertain dignitaries on the royal yacht even during her honeymoon, like it or not. Nice to see she's getting down to work right away. KF - Yes ! Princess Charlene rocks. She is a doer, not a slacker. Prince Albert got lucky. his choice has impressed me. Now produce your heir and be happy !! KF - Thank God the LAPD is threatening fotogs to stay away. LOL. No pics of The Grinning Basketcase. Hopefully. I have never been impressed with her Doesn't speak french , botoxed her face to a pulp,she has shown no substance over the years....each to its own i guess She has been giving a makeover to make her look classy and elegant and has an army to make her look her best .She does deserve an ovation for willing to be in the same space as Albert. Perhaps she didn't learn French because she was a realist about her chances of becoming Albert's wife. She didn't assume that anything was going to happen and she didn't presume to prep herself for something that might not have happened. Albert does not have a good track record of commitment and she was samrtt enough not to bother with learning things that she likely would not have used in the future in the first place. ^ Good point. Albert is 53 years old, never married but had many girlfriends in the past, some long-term, some short flings. She probably didn't know he would ask to marry her. Maybe she even assumed that, with Caroline acting as first lady, Andrea would be the next Prince of Monaco. And what language does Albert speak at home? There's a good chance he speaks a lot of English, with an American mother and all. Even PW spoke French rather well when he gave a speech in Ottawa. rather well?? I nearly choked on my coffee when I heard it. The British aren't big on languages, but damn he will be their King. William should have done better than that especially since he was able to learn it by heart. Here is what I've found out: She is learning French. translation Charlene: "I understand a lot more and speak a little." She can read the newspapers without a problem. "I read a lot of newspapers, you can't be informed enough." But on her wedding day she said one sentence in English she could have easily learned by heart in French. Especially since she is living in Monaco for 4 years! I know French is very hard to learn, but if you are living in a country it is easier. The more people you have around you who are speaking the language the quicker you learn it. ie. I have spend time in a Spanish guest family and because they didn't speak a word English or German I had to learn Spanish. After a few weeks it was the most normal thing in the world and my Spanish was never better. The palace should stop speaking English with her and her French would progress much faster. But then they would be accused of mobbing. In the end it's all on her will to learn it. I say it would be totally arrogant of her to not give a damn about their language. Last hope for the Windsors: Anne for Queen! But on her wedding day she said one sentence in English she could have easily learned by heart in French. I agree TCP. "Merci, Monaco, pour tous" is all it takes. I'm a perfectionist when it comes to languages and bad translations make me cringe! OK, back into the box with you Hermione Granger, enough of your know it all attitude! They must speak English in Monaco more than we thought. I neither like or dislike her. I just think that she should be fluent in French after all those years and free time to study the language. French may be tricky and difficult to learn, but if she has been working really hard as you say, she could be fluent by now. I am fluent in French - more than I am in English - and as for French changing, never, ever heard of that. Except of slangs and some minor points. It is a very classical language which Frenchs are very proud of and try to keep at all costs. Are you fluent or have you ever studied French? Albert most likely speaks English at home, he actually sounds American, probably because his mother was American.